It was another smart casual day today, Raph and I were in London for lunch and a meeting. I’ll be honest that I’d imagined a fancy slap-up steak lunch, but we ended in a health food restaurant where the food was mostly vegetarian and I didn’t know most of the ingredients! It was still pretty good and the meeting was positive — I got some great advice from people who know what they are talking about. After that, it was back on the train to Cambridge, same old route, same old trip, same old faces, but as we got off the train in Cambridge I looked up and saw a face that I recognised. There’s nothing strange about that — I’ve lived here for years and I’m hardly shy about getting to know people, but this was different and I couldn’t quite put my finger on it. Open-collar shirt and raincoat, nothing flash, nothing branded, nothing special. People boarding the train with a bicycle is obviously not an unusual sight in Cambridge, not a fancy one, or a fold up one, or carbon fibre anything, just a non-descript regular bike that you would pick up for a few quid second-hand. 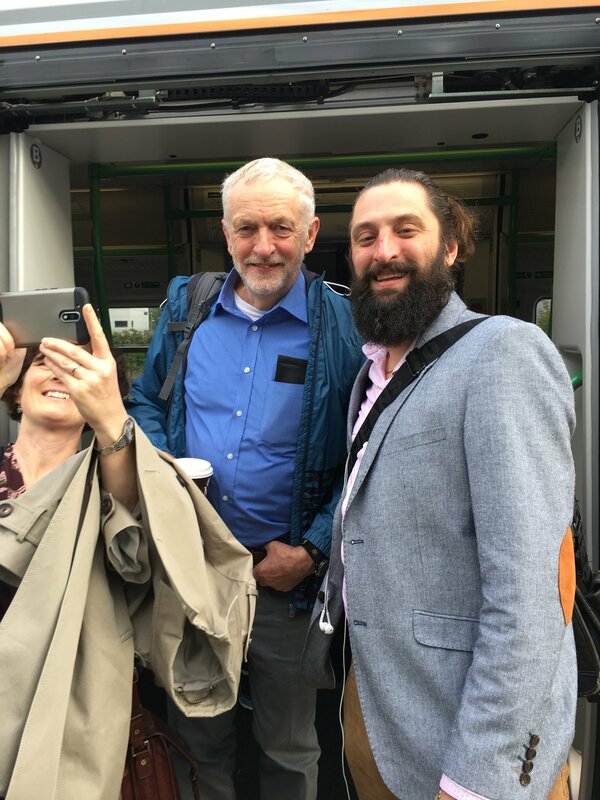 This was just a man on the platform with his bike and his wife (also with a bike in tow) but after staring for longer than is probably polite, I tentatively asked his wife, “is that Jeremy Corbyn?” “Yes,” she answered and called him over to say hello. I couldn’t believe it, this was the leader of the opposition, someone who had inspired me and others to vote for the first time during the last election! There was no sign of bodyguards, entourage, media or spin doctors, just a normal bloke getting on the train with his wife and their bikes. I don’t know the circumstances of his visit but I can imagine him catching trains all over the country with that bike. I can imagine him cycling to meetings and shunning private cars when he can and using public transport. The reason I can picture this is because it’s all I’ve seen, he has endured the press and withheld from countering ridiculous claims, he has stood by his beliefs and he has shown compassion and understanding rather than just regurgitating political drivel, and today I saw why — he’s just a normal bloke who actually believes what he says and doesn’t let it all change who he is. Cheers Jeremy! It was a pleasure to shake your hand. But the question on my mind (and surely many more) is this: Anton knows he met Jeremy, but does Jeremy know he met Anton ? Would – or wouldn’t ? !